If you're a parent like I am, or if you might happen to know someone having problems about their kids bored and is trying to look for activities that might get them going and having fun during vacation, here is one of the great things you can have them do. 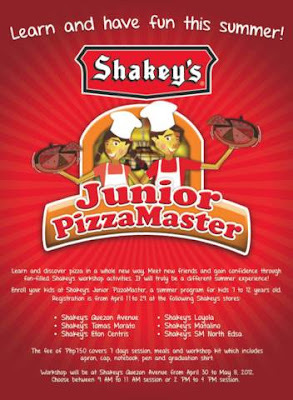 If your kids are 7 to 12 years old, let Shakey's challenge them to become Shakey's Junior Pizza Masters. A first of its kind in the country, this summer program will immerse kids in our world-renowned tag of fun, family, pizza. If your family love indulging on them, your kids will definitely have a high time making them while mingling with other kids, building a plight of competitiveness as they do. The 7 day program will run from April 30 to May 8 at Shakey's Quezon Avenue. So head on and register them at Shakey's Eton, Shakey's Loyola, Shakey's Matalino, Shakey's North Edsa, Shakey's Tomas Morato and Shakey's Quezon Avenue until April 29, 2012. Slots are limited to 100 kids only with a morning or afternoon session of your choice. By the end of the summer course, the new Shakey's Junior Pizza Masters will be experts in making the Shakey's world famous brick oven baked pizza. The training fee of P750 is inclusive of notebook and pen, apron, meal stubs for 7 days and a graduation shirt. 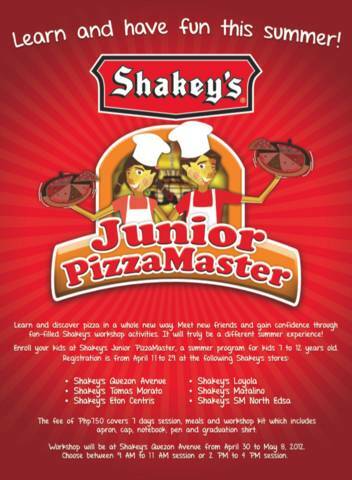 The graduation on May 8 will be made more exciting with a Dough-Tossing Demo among the first-ever batch of Shakey's Junior Pizza Masters plus lots of fun games and prizes. I am sure you and your kids are excited to have a more meaningful summer with the Shakey's Junior Pizza Masters workshop! Look for Ms.Debi Labarda or Ms. Eymare Bacasmas for more details. By the way, your link is up and running already at my blog. Hope to see my blog link at this blog of yours as well. Thanks!